This license plate art tells the story of a student graduating from Ole Miss this year, and his love of life. With the help of one really cool mom -- and I mean that -- I was able to recreate his college experiance. I started out by spelling Ole Miss down the neck, then used my signature flag style as a template to insert all his stops during his college journey. Look closely and you'll see all the states he visited during his college years. You'll find Alabama's Auburn logo, Florida (because that's where he from), Georgia, Kentucky, Missouri, South Carolina, Texas, Tennessee and Louisana. Then I added the fun stuff. His favorite drinks -- Surfer on Acid, Landshark and Stellla beer -- are featured around the outside. Finally, his mom told me he has a saying that I featured on the bridge: "The adventure begins when something goes wrong." I spelled this out with many small license plate letters rather than set into another tag as a base. 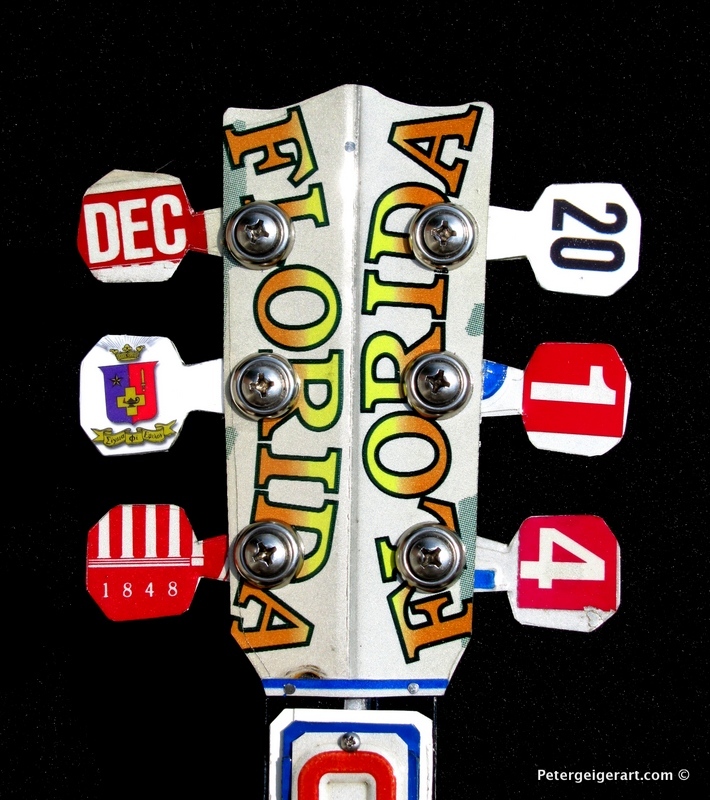 His graduation date and fraternity are featured on the headstock and keys. When my client Lori received her license plate guitar, she was kind enough to call me to express her thanks, and sent an email to sum up her gratitude.